Do you need more reliable power with advance battery management in a space saving design? HPE Line Interactive Tower Uninterruptible Power Systems deliver clean power with an advanced battery management capability. Computing environments are expected to deal with the frequencies and severities of power outages, increased power demands from the public and private cloud, software as a service (SaaS), and mobile computing plus online services and applications while maintaining tight cost controls. 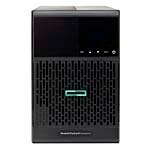 HPE Line Interactive Tower Uninterruptible Power Systems were designed to meet these needs and exceed expectations as the industry requires a reliable, efficient and easy-to-use UPS within your computing environment. Slim tower design helps to conserve valuable space and can be easily installed in most office, retail, and/or IT environments. Next-generation LCD offers a graphical interface which provides all critical UPS information in a single screen view. Batteries can be hot-swapped safely without ever shutting down IT equipment. Remote access through an optional 1GbE-based network management card ensures widespread connectivity with most user networks. Web-based management application, HPE Power Protector, allows you to monitor, manage, and control a single UPS, locally and remotely. Outlet switching at the load segment level allows you to control and prioritize access to UPS power. Capable of protecting more devices with up to 14% more power as compared to previous generation HPE Tower UPS models. Industry leading efficiency of up to 99% helps to ensure minimal power loss and lower power costs. Management Software: Power Management including HPE Power Protector software. Note: Battery runtimes are approximate and may vary with equipment, configuration, battery age, temperature, etc.